Criminals, especially burglars, want to get in and out as quickly and as quietly as possible. They choose their targets by watching homes and looking for tell tale signs that the occupant has let down their guard. They know what to look for, do you? We are going to share the top 10 security flaws that most people overlook or take for granted. These are sure indicators for a criminal that says, "come on in, the house is yours." #1 - Lack of proper lighting. A sure sign that someone isn't home are lights that run 24/7 or are never on. Be sure to utilize timers for indoor and outdoor lighting with set on/off cycles. Not only does this make it appear that someone is home, but the lights will be on when you get home giving you more notice if something is out of place. For added security, have music or a tv playing during the day. #2 - Handy tools left in the yard. We all get tired after working in the yard all day, however, the things you leave lying about could actually be used to gain access to your home. Think ladders to gain access to windows and yard tools that can pry open doors, windows, etc. #3 - Did you lock the windows? We think that if we close the windows that will be enough to deter burglars. The reality is that they will try them to see if they open. Also lock your windows when you close them. The same goes with your doors and especially sliding glass doors. Make sure sliding glass doors have security bolts installed. #4 - The Spare Key. How many of you are still hiding the spare key under the back door mat, that favorite rock next to the doorway, or above the door casing? Burglars look for these things. Do not keep spare keys laying in the yard for someone to find. Give them to a trusted neighbor or friend that will be able to check on things. #5 - Landscaping. Take a look at your hedges, trees, bushes and determine whether or not someone can hide behind or in them. If yes, it's time to take the pruning shears to them and clean them up. If you are going to plant bushes next to the house, make sure they have thorns or are uncomfortable for someone to hide behind. You want to be able to see your doors and windows and not have your landscaping obstruct their view. Remember, if you can't see your windows and doors because of your landscaping, you can't see the criminal getting into your home. #6 - Privacy Fence. Privacy fences are beautiful, however, they also block the view of someone entering into your home. Be careful when choosing fencing, and if you want the privacy fencing, make sure that you have motion detectors and alarms in the back. #7 - Empty Boxes. There's nothing that says "ROB ME" better than putting out empty appliance and TV boxes. Break these down and fold them inside out so that you cannot easily identify what you just bought. #8 - Name on the Mailbox. There is no reason to place any identifying information about yourself on your mailbox, home or welcome mat. All of these give criminals easy access to get further information about you. Also, it is easier to scam you by pretending to be utility, maintenance, delivery personal just because they already have your name. #9 - Deliveries. Nothing says "come on in, no one's home" better than three days of newspapers in the yard and a mailbox full of mail. Either stop your deliveries when you're away, or have your neighbor / friends come and pick them up. #10 - The Peephole. We have become Pavlov conditioned to open the door once we hear a knock or a ring. But do you really need to? Do you check to see who is on the other side? Do you have a peephole? Unlocked or poorly secured doors are the main entries for burglars into your home. This includes the door from the garage to the house. Make sure you are using deadbolts which prevents a door from being kicked in. The best test to see if your home can be broken into is for you to do a walk-around and try to break into your own home. 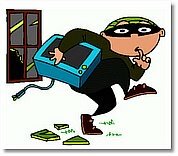 If you can think it, trust us when we say a burglar most certainly will also. Be creative and identify the weak points in your home and then take the necessary steps to fortify your castle. For more safety tips, feel free to visit our Safety Tips page.